Ever heard of the phrase "happy wife, happy life"? Well since I am not yet a wife, I thought I would change my phrase to "happy health, happy life." I consider myself a pretty healthy and active person, but I do love baked goods, pasta, and lounging around watching episodes of the Real Housewives of whatever. One goal I have been wanting to tackle is to train for a 5K run. I first want to mention that I totally HATE running! You may be wondering why I would ever want to run a 5K, and I am actually wondering that myself. I have always been envious of those who can run marathons, and after finding a 0 to 5K app, I thought that maybe I could actually do this. 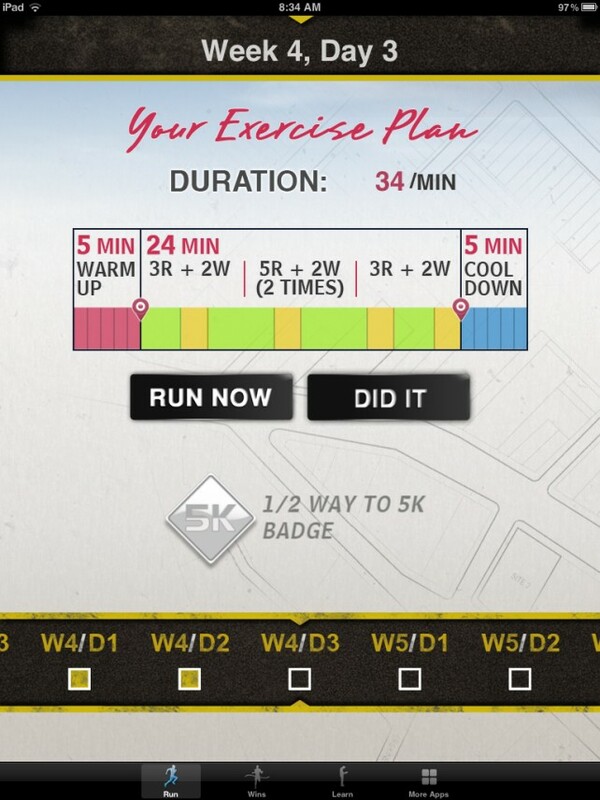 The app says that it can train anyone to run a 5K in 8 weeks, 3 times a week, 35 minutes each time. I say good luck, but let's try it and see what happens. I have completed my first week of training and so far it's not too bad. For the first week you walk for 5 mins, then run for 1 min, walk for 1.5 mins, and continue to run walk for the next 20 mins. Then you have a 5 min cooldown. I have been walking at 4.2 and running 6.5 on the treadmill. Still haven't tackeled running outside, but will probably do that once it gets a little cooler. The first day I was getting a little breathless towards the end during my 1 min runs. Yes breathless from running for 1 min...ha! Although I do work out regulary taking Spin and Zumba dance classes, I just could not run to save my life. But by the second and third workout, the 1 min run seemed to fly by and I was like, "wait a min, are we really ready to walk again??" I typically workout after work, so having a snack in the late afternoon helps keep my energy up. I am loving Lara Bars! It's still too early to tell, but I'll post some updates as I continue on this journey and we will see if by the end of August I can run a 5K or not. My goal is to try and find a 5K to run in the fall to complete my goal. Wish me luck! Good luck! My roommate has run half-marathons and is always trying to get me to start running. Maybe I should try this and surprise her...lol!